When mounted centrally on a ceiling, the 360°camera lens gives complete wall‑to‑wall coverage. Panoramic surveillance offers full 360° coverage of the designated area. Because our panoramic cameras cover the full area, they provide complete situational awareness and are ideally suited to following movement in one continuous sweep. The high 5MP sensor resolution together with a frame rate of 15 fps makes this camera an ideal solution for many applications in the field of panoramic image capture. The high resolution provides a clear overview and detailed images. With client-side dewarping, the camera streams a single circular non-dewarped image at 15 fps. Dewarping is performed with our dewarping software that is installed on the PC where multiple view modes are available or you can choose to use a third-party client-side dewarping software solution. The remote E-PTZ (Electronic Pan, Tilt and Zoom) controls allow you to select specific areas of the full image circle. These Regions of Interest (ROI) can be easily defined, allowing the most interesting part of a scene to be monitored separately. The high resolution ensures that details are not lost even when using the electronic zoom. The E-PTZ feature of a panoramic camera has some advantages over normal PTZ cameras. There is no camera movement so the camera does not draw attention to itself or appear intrusive. Situational awareness is still retained even when zooming in on a particular object of interest. The smooth E- PTZ function helps navigation, and presets are available as they are with regular PTZ cameras. The camera provides the full resolution circular image for recording even if you are viewing only a portion of the scene. This means that you can always perform retrospective dewarping and analyses on the complete area covered and then zoom in on the region or object of interest. Quiet scenes with little or no movement require a lower bitrate. By intelligently distinguishing between noise and relevant information, Intelligent Dynamic Noise Reduction reduces bitrate by up to 50%. Because noise is reduced at the source during image capture, the lower bitrate does not compromise on video quality. The MOTION+ video motion analysis system that is built into all camera versions is the perfect solution for applications where basic video content analysis features are required. MOTION+ shows motion metadata in an overlay display. By using MOTION+ data as input, smarter imaging algorithms bring improved image quality and more efficient bitrates. It also enables extended tamper detection capabilities. The innovative multi-streaming feature delivers various H.264 streams together with an M‑JPEG stream. These streams facilitate bandwidth-efficient viewing and recording, plus easy integration with third-party video management systems. The indoor version of the camera has a built-in microphone to allow operators to listen in on the monitored area. Audio detection can be used to generate an alarm if needed. If required by local laws, the microphone can be permanently blocked via a secure license key. Power for the camera can be supplied via a Power over-Ethernet compliant network cable connection. With this configuration, only a single cable connection is required to view, power, and control the camera. Using PoE makes installation easier and more cost effective, as cameras do not require a local power source. The camera can also be supplied with power from +12 VDC power supplies. The camera is pre-assembled with an indoor surface mount bracket which allows you to mount the camera directly onto a ceiling, wall or single-gang box. The rear connectors are orientated for easy accessibility. A complete set of mounting accessories, such as a wall or pipe mount, are available. No focus or pan/tilt adjustments are required as the camera, with its 360° lens, provides complete coverage of a small room. The high quality lens is factory focused and so installation is simplified and sharpness is assured. The indoor version is designed to resemble a smoke detector. This compact design offers discreet and unobtrusive placement in any indoor environment. The outdoor version with cast-aluminium housing and transparent bubble is designed to withstand the equivalent of 20 joule of impact force (IK10), which is equivalent to a 5 kg (12 lbs) steel ball dropped from 40cm. Together with the outdoor surface mount box provided in the package, the outdoor version is protected against water and dust ingress according to IP66. This makes it ideal for outdoor use in demanding environments. The camera has a very intuitive user interface that allows fast and easy configuration. Configurable scene modes are provided with the best settings for a variety of applications. Password protection with three levels and 802.1x authentication is supported. To secure Web browser access, use HTTPS with a SSL certificate stored in the camera. The Video Security Client has extensive dewarping capabilities and can be used for client-side dewarping as well as for viewing the available modes. Because the camera supplies a full circle image stream, it can easily integrate with third-party client side dewarping software solutions. 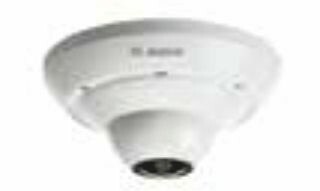 NUC-52051-F0 FLEXIDOME IP panoramic 5000 MP Compact indoor IP panoramic camera for all-round MP surveillance. 5MP sensor; PoE/12 VDC; IDNR; H.264 multiple streams; cloud services; client-side dewarping, 360° lens; indoor surface mount box included. NUC-52051-F0E FLEXIDOME IP panoramic 5000 MP Compact outdoor IP panoramic camera for all-round MP surveillance. 5MP sensor; PoE/12 VDC; IDNR; H.264 multiple streams; cloud services; client-side dewarping, 360° lens; IK10; IP66 outdoor surface mount box included.